I'm afraid this one hardly merits "Project" status. I have an old Atlas/craftsman 12" x 36" lathe which I've used very little. It has been in storage mainly, and I finally cleared out enough space around it to do some machining. I tend to use the faceplate a lot, and turning stuff between centers. It does have a 3 jaw chuck, and I haven't paid much attention to it. But today when drilling out some pulleys I with the 3-jaw had a difficult time adjusting them to center. The old paper under one jaw trick couldn't take up the excessive amount of runout. So I decided to stop and do something about it. I had a Dremel in a drawer and conveniently one new stone for it right by. On a shelf near the lathe I saw an unopened tube of JB Weld epoxy putty. I also had a piece of 5/16" key stock in my scrap box, so I sawed off a chunk, grabbed the other items and trudged back to the house. Shop temperature is 30F today so no gluing there! Back home I rough sanded down a spot on the Dremel. Then I cut off a chunk of the epoxy putty and warmed it up for 10 seconds in the microwave and kneaded it. Stuck the keystock onto the Dremel with the putty and smoothed it down with a wet finger. JBWeld epoxy putty cures quickly -- you have about 3 minutes to work it, and full cure is effected in only an hour. I've found to be a very high quality and tough material, and to give a good bond. Other brands I've tried never worked as well, or cured as quickly. It was rock hard in a half hour, so back down to the shop, and popped it into the tool holder. A few adjustments later and with the lathe turning at its highest speed to keep the jaws out at edge on the scroll and the grinder running, I just touched the stone to the jaws enough to see a couple sparks. Traversed in to clean up the jaws. switched off, and back out. Then repeated a couple more times until I could just see a few tiny high spots ground off on the jaw that was the narrowest -- the others had been ground a little bit more. And then called it done. Worked fine, and the pulleys were easily centered and drilled. There was some discussion about truing 3-jaws some time ago. It's important to load the jaws as though they're clamping something whilst you grind them. Basically the angle of the jaws clamps on the sides of the slots in the tube and the point of the jaw protrudes through the slots enabling them to be ground. Hi Phil, thanks! Looks like a good solution to doing a good job of it. Thanks for the thread reference -- I read it through. I had heard that spinning the jaws at the highest lathe speed would do basically the same thing by centrifugal force acting on the jaws to keep them tight to the scroll. That seems to have worked for me. I seen this before and I did not know it was vtsteam. How did grinding your chuck work out? I forgot where I seen it and that is the reason I getting back to you now. I just wonder if it worked or not. I saw it years ago on some early site dedicated to the Asian style mini-lathe's. I don't think the original writer used JBWeld putty to attach an adapter block, maybe he used fastenings -- can't remember. 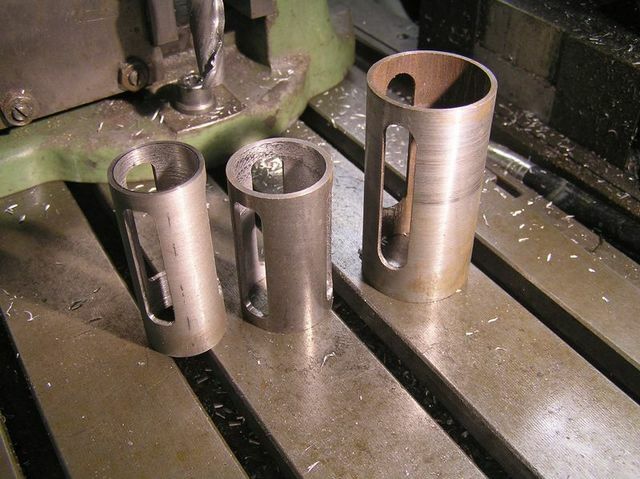 But anyway, yes the end result was the same, and yes he used the high speed of the lathe to keep the jaws out against the chuck's internal scroll. I have 4 chucks all of which are decent quality for my boxford. Yet 3 of them have worn jaws and so I can only use one of them!! 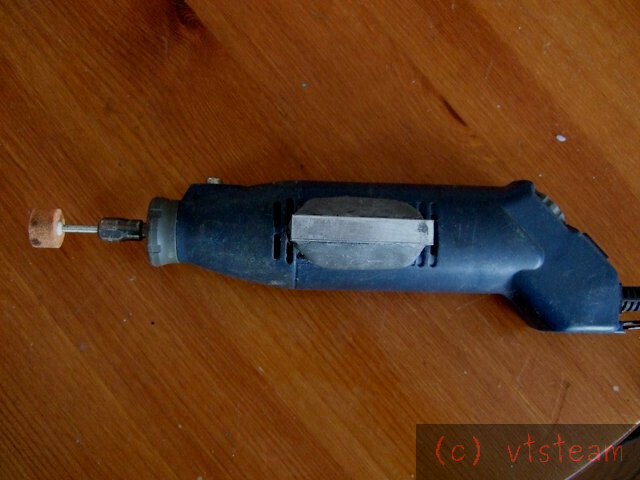 I've considered something similar as I can't afford a tool post grinder right now. 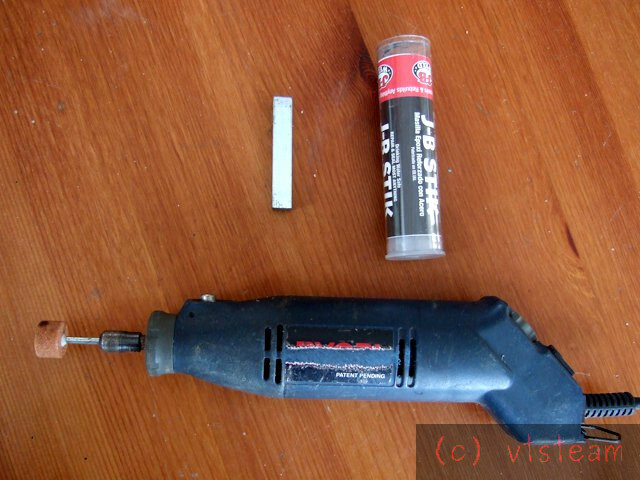 I'd just be concerned how rigid the Dremel sits on the tool post and the runout of the dremel, but then if it worked for you...! I might be following you. The run out on the Dremel cancels out if you dress your stone first, I agree rigidity is potentially an issue - it will tend to bounce and not give you a good surface finish. Microscopic feeds I reckon! Chris, I thought you made a very whizzy milling spindle with a brushless motor. Wouldn't that be more rigid than a Dremel? Back to my old suggestion of using a router. No, it will not mend a worn scroll or chuck jaw guides. Those need a firmly grasped wallet spanner but it will grind the insides of the worn jaws. Any other bright suggestions are not much removed from chucking snow balls at the moon. And I'd like a penny for every time that I have written that. Yes to extremely fine feeds -- one spark or two is enough. Out of roundness, Dremel runout, and the flexibility involved here are not issues for precision, assuming you don't try to break the grinding rig by bouncing it off the jaws with a heavy feed. 1.) The stone is rotating. The jaws are rotating. The stone is moved axially all the way through the jaws parallel with the ways (because it is driven along the ways by the carriage). Therefore the full length of each jaw is subjected to the same high spots on the stone and the same run out and any other errors, and these are applied to all jaws along their full length, parallel to the ways. All of the jaws see the same thing, parallel to the ways. The only way a taper could be introduced, is if the headstock spindle itself is not parallel to the ways. 2.) With extremely light pressure (which is ALL you want, assuming a reasonably true chuck-- a few individual sparks with each feed adjustment) you are not wearing down the wheel at all. 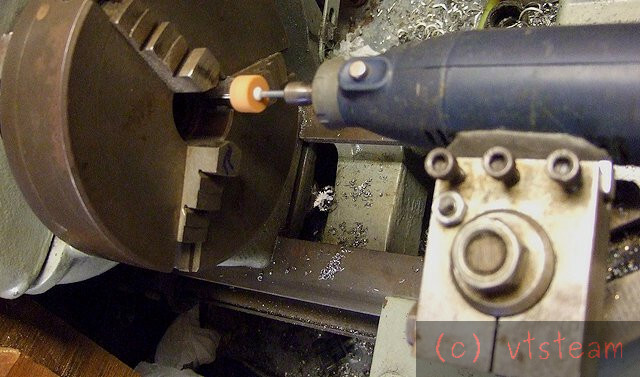 Any high spot on the wheel is just ticking a high spot on the jaw, removing metal. When that stops, and not before, you can feed the stone outward a very tiny amount again with the cross slide. Then make passes again through the bore with the carriage at that position until the ticks stop again. Check that all jaws show some shine along their gripping edge. Done. 3.) Bending is not an issue with very light feed, and waiting for the ticks to stop. When the ticks stop there is no bending. There is no force on the stone. Just before that there is infinitesimal force on the stone. Think of it as reaching the limit of an equation. Actually, bounce, shouldn't be there in the first place -- this isn't hogging on a grinder. It needs to be done slowly with a light touch. Any supposed bounce will reduce to nothing at the point when the jaws are no longer grinding at all. 4.) The high jaws are reducing in size as you grind them. Eventually after a few rotations and feeds all three are the same height. Nobody is bouncing or even grinding when the ticks disappear. Each jaw is subjected to the same conditions, and the all level out. That's the principle. I found the reference URL that I used to do this. It worked perfectly for me with the Dremel.